Racine Roofing and Remodeling provides masonry restoration & repairs in Racine, Kenosha, Sturtevant, Caledonia, Milwaukee, and Franksville, as well as all over Wisconsin. Masonry is a special art, but at Racine Roofing & Remodeling, we are not a secret club. We want you to be a member, and we want you to be more educated about the advantages and disadvantages of masonry. For example, advantages of masonry include; the use of material such as bricks and stones can increase the thermal mass of a building and can protect the building from fire, masonry is a non-combustible product, and masonry walls are more resistant to projectiles, such as debris from hurricanes or tornadoes. Disadvantages of masonry are that it is heavy, therefore it must be built upon a strong foundation, such as reinforced concrete, to avoid settling and cracking and that it consists of loose components, causing it to have a low tolerance to oscillation as compared to other materials such as reinforced concrete, plastics, wood, or metals. At Racine Roofing & Remodeling, we take special care with your masonry needs, from the engineering design, to inspections, to the finished product, all while correctly interpreting prescriptive and performance-based building code requirements and industry standards, as well as taking more than adequate safety measures. We effectively formulate reasonable details and scope requirements for all your projects before getting started. From traditional stone patios to trendy outdoor fireplaces, let our knowledgeable team tackle your masonry projects with creativity and skill. We can do repairs or remodeling on your existing stonework, or we can create complete transformations of your space. Whether indoors or out, we will do immaculate, quality work for all your masonry needs at your home or commercial building and site. Blocks are elements of masonry construction in which uniformly shaped individual units are laid in layers with mortar as the bed and binding material. They consist of high mass materials with good compressive strength which is formed into units that can be lifted and handled by a single person. Materials can include brick, stone (marble, granite, travertine, or limestone), manufactured stone, concrete, glass, stucco, and tile. Blockwork is usually rendered (coated with plaster or stucco), but most blocks can be used as facing materials or given a render coating. Exposure to harsh weather conditions or improper foundation work can leave your brickwork lacking. 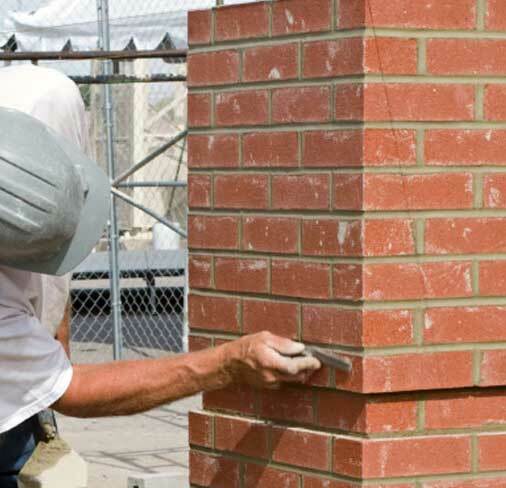 Extend the life of your brickwork with proper maintenance and regular pressure washing on your chimneys, sidewalks, facades, foundations, patios, stairs, or any of your brick constructions. California Stucco is a dense, durable form of render (sealing coat) that is usually used decoratively to cover unsightly materials such as metal, concrete, cinder block, clay brick, and adobe. Block fluids, sounds, dust, and heat transmissions from seeping through joints and openings in all your projects. Silicone, latex, acrylic, butyl rubber, and oil-based asphalt are just a few options for your caulking needs. With so many types of caulk to choose from, we will take the guessing out of it for you, picking the appropriate materials for each and every job. Coat your concrete, brick, stone, stucco or other surfaces to protect from water, oil, solvents, fungi, and ultraviolet radiation, as well as make them easier to clean. Thoroseal is a cementitious waterproof coating designed to be used in below grade applications subject to hydrostatic pressure both on the positive and negative side, such as your swimming pool, while Thorocoat is a 100% acrylic coating designed to be used above grade. Coping refers to covering or capping a wall. Splayed (also known as wedge) coping, slopes in one direction, while saddle coping slopes to either direction of a central high point. The slope, or bevel, is meant to shed water so that it does not run down the face of the wall. If your corners are weathered or chipping, we will restore them to their original beauty. This is the only job where we will cut corners for you! EIFS refers to exterior insulation finishing systems that can be polymer-based (non-cementitious finish coat) or polymer-modified (cementitious finish coat), with the former being the most widely used. A polymer-based system consists of a base layer of insulation board attached to the wall sheathing. Additional boards can be used to create specific architectural looks. Next, a thin base coat is applied over the boards, with a fiberglass reinforcing mesh embedded into the base coat. Finally, the finish coat, available in a myriad of colors and textures, is applied over the base coat. We use only the finest brands on the market, such as Decoplast. Synthetic stucco is also known as acrylic stucco. Facade work is a science, and our professionals have the education and experience necessary to do an immaculate job for you. The facade (the front of the building, especially an imposing or decorative one) is one of the largest and most important aspects of the aesthetic and technical performance of your building. Trust us with the face of your structure. Whether you have noticed water seepage or your parapet is starting to bend, there could be a good reason to repair it today. Damaged structural masonry may cause problems with other structural elements of your building, so don’t wait to get the reconstruction you need. Precast concrete is casted in a reusable mold, is cured in a controlled environment, and then it is transported to your location, as opposed to standard concrete, which is poured on site. Advantages to precast concrete are that it can be properly cured and closely monitored by our proficient laborers. Differing in size, function, and cost, there are many types of precast concrete forming systems that can be used for a slew of architectural applications, such as stormwater drainage, water and sewage pipes, and tunnels. Take advantage of the expert safety precautions our team uses to pressure wash your exterior surfaces in preparation to paint, or perhaps you just need your parking lot, deck, boat, trailer, or other equipment to look like new. Remove chipped paint, dirt, mold, mildew, oil, or other chemicals to ensure the longevity of your building or other beloved items. Retaining walls are meant to confine soil to a slope that it would not naturally keep to such as a steep, near-vertical, or vertical slope. They are frequently used in areas of terrain possessing undesirable slopes or in areas where the landscape needs to be shaped severely and engineered for more specific purposes like hillside farming or roadway overpasses. Although a basement wall is technically a retaining wall, the term usually refers to a freestanding structure. Specialty and ornamental masonry is not outside the scope of our skillset. Terra-cotta is your clay based, porous ceramic material, and it is a type of earthenware. Architectural terra-cotta can also refer to decorated ceramic elements such as antefixes (an ornament above the top molding of a cornice) and revetments (a facing of masonry or the like, especially for protecting an embankment). Traditional stucco is made of cement, sand, lime and water, and it is also known as classic stucco, hard coat stucco, cement stucco finish, and hard coat finish, to name a few. When comparing traditional stucco to synthetic stucco, its advantages are that it costs less and there is really no limit to the number of textures that you can achieve, because different sized sand is used to get smooth finishes, to rough finishes, and everything in between. However, since this is a cement based product, the color tends to be dimmer than acrylics and not as consistent, so lighter colors are recommended for this application. Each batch of traditional stucco that is mixed will differ slightly, so it is much harder to keep an unvarying color with this product, so let our professionals handle this tricky task for you.